Dearies, you may have noticed that Kat and I have been getting more creative in the kitchen with tea recipes. I realized we haven’t done much baking with tea, and I set out to change all of that! Today I’m so thrilled to share our recipe for Earl grey banana bread. Kat has enjoyed earl grey in baked goods before, and has even had it in chocolate truffles. I thought adding it to moist and springy banana bread would be a surprising and delicious addition to the afternoon tea table. Or for breakfast, or really, any time of day! Bring the water to a boil in a small saucepan. Remove from heat and add the tea. Allow the tea to steep for 5-10 minutes (you want a very strong tea). Add the sugars and butter and return the pan and heat on medium. Cook until the butter and sugars melt and combine. Once you have a thick, combined mixture, allow to cool to room temp. In a large bowl combine the yogurt and baking soda. Let stand for about 5 minutes, until the mixture looks a bit puffy. Stir in the cooled tea mixture and the eggs. Sift in flour and combine. Carefully fold in the mashed bananas. Pour batter into pan(s). We like to use mini loaf pans, so we fill them 1/3 way full. You’ll need room for the bread to rise. Bake for about 1 1/2 hours if you are making 2 large loaf pans. Less if you are using small pans like we are. Start checking around 30 minutes. Bake until a tester (we use a chopstick or knife) comes out clean. Once done, remove from the oven and allow to fully cool on a rack. I do hope you enjoy my Earl Grey Banana bread recipe! We make a few mini loaves at a time and store a few in the freezer. This way Kat always has a sweet treat to serve when company arrives. The combination of the citrusy early grey, rich banana, and lemon makes a delightful cake with an irresistible chewy texture. I noticed Kat sneaking a few slices throughout the day. I think you’ll agree that this cake is the perfect tea time accompaniment! Pack sealed tea bags: Packing your own individually wrapped tea bags are a simple way to make tasty tea in the office. Kat brings in various bags of tea and keeps them in her desk drawer so she can choose one based on her mood. Right now her favorite afternoon tea is this Wegman’s Just Tea Earl Grey Black. She picked it up at the Wegmans near her office, and it’s been a staple ever since. It’s the perfect blend of citrusy bergamot and malty black tea. It gives her a little lift before a particularly long meeting. She has even shared a few bags with her co-workers and they have all appreciated the tasty treat. 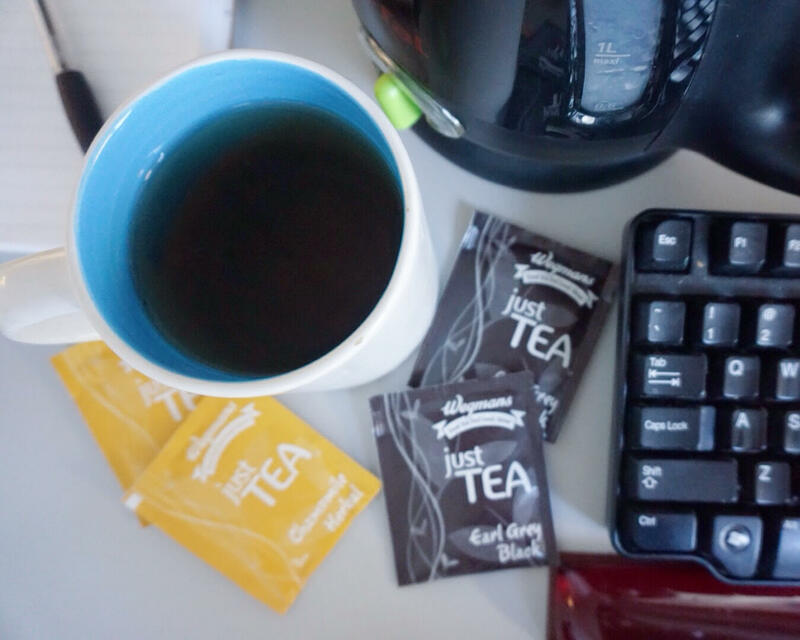 Another tea I spied in her desk is Wegmans Just Tea Chamomile Herbal. She keeps it around the office for when things get a little hectic and she needs a few moments to relax. It has worked wonders during a stressful day. The floral chamomile flavor is an instant oasis from stress. It also smells heavenly! Use a mug: A reusable mug is also essential. Drinking your tea from a paper cup is fine in a pinch, but you will enhance your office tea experience with a real mug to remind you of home. Or choose a pretty teacup to bring with you, or keep in the office. A favorite cup will brighten your work day tremendously (I should know!). Water: Hot water is of course essential. If your office does not provide hot water, an electric kettle is a helpful addition. If you are unable to use one in your office, you can easily put cold water in a microwave safe mug, and microwave until it is hot enough. You can also keep a thermos of hot water at your desk so you don’t have to constantly visit the office kitchen. In addition to the essentials, you can add a few other flourishes to enjoy tea during your day- A tasty sweet snack will make tea time more satisfying. Clearing a little space on your desk to devote to tea time will also make it feel extra special. Your tea break will clear your mind and get your ready for that next meeting or presentation. I overheard Kat and her friends saying that tough projects are easier to accomplish with a tasty mug of tea at your side. Do you enjoy tea at work? I’d love to hear about what your office tea time looks like! Earl Grey, one of the most popular teas in the world, has a mysterious past. Where did it come from, when did it first appear on the tea scene, and who was THE Earl Grey? While there are many variations of Earl Grey tea (Lady Grey, Double Earl Grey, or Russian Earl Grey), by definition, Earl Grey tea is a black tea that is flavored by the oil from the rind of the bergamot orange. These oranges are most commonly found in Italy. While it’s easy to define what it is, it’s not so easy to define how it came about. Most recently, in 2012, researchers at the Oxford English Dictionary discovered the earliest known reference to bergamot-flavored tea was in 1824. At that time, it appears the flavoring was used to enhance lower quality teas. Not exactly a note-worthy start for a now-beloved tea! – Earl Grey’s dear Mandarin friend was kind enough to create this blend to reduce the flavors of minerals found in the water of the Earl’s home. – Because of some favors granted to China, the Earl was given the tea blend recipe as a thank you gift. – Just as the discovery of tea itself was an accident (a tea leaf dropping into an Emperor’s cup of boiling water), the blend occurred when a shipment of tea and a shipment of bergamot oranges traversed the sea together in the same cargo hold and the tea absorbed the essence in passage. The Earl Grey, himself, is a bit of a minor historical figure. Charles Grey inherited the title of Earl after the passing of his father, the first Earl Grey. He was Prime Minister from 1830 to 1834 and has two significant acts credited to his time in office (the Reform Act of 1832 and the Slavery Abolition Act of 1833). He also fathered a child out of wedlock (quite a scandal in those days!). While it might be useful lore to say the Earl himself had a hand in the creation or popularization of the tea blend bearing his name, my guess is that some cunning tea seller invented it (and a connection to a known political figure) to boost sales. Regardless, there’s a reason Earl Grey is one of the most popular teas in the U.S. and the world. It’s delicious, plain and simple! 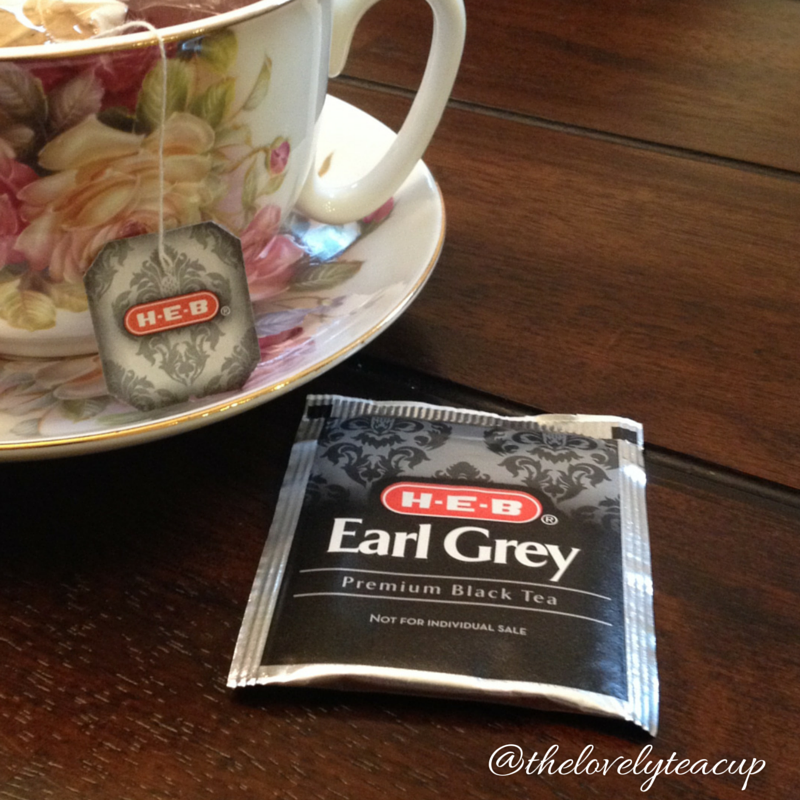 One of Kat’s favorites is HEB’s Earl Grey. The experience begins with the steeping, as she inhales the combined scents of the malty black tea and the sweet citrus of the fragrant bergamot. We’ve found some Earl Grey teas that have too much bergamot, which can give a soapy taste, but this one has the perfect balance: just a hint of bright sweetness with the bold black tea. There are some days she adds milk and sugar and other days where she drinks it plain. It is both the height of luxury and a tea for everyman (or woman!). What’s your favorite Earl Grey legend? How Char loved the Easter season! She absolutely luxuriated in the traditions around the world. Easter in France consisted of enjoying the Poisson d’Avril (April Fish), which are fish-shaped chocolates that signify the spring season. Church bells are silenced on Good Friday, and the children are told that the chimes have flown to Rome to visit the Pope. On Easter Sunday when the chimes ring again, the children search for Easter eggs that the “chimes” have brought back with them from Rome. In Seville, Spain, Char and I would watch from her friend’s tiny balcony as the confradias (brotherhoods) would slowly, carefully, carry beautiful, ornate statues of the Virgin Mary on their shoulders through the narrow, cobbled streets. During an Easter visit to Portugal, Char fell in love with the savory bread, known as folar, made with cured meats and always with a hard boiled egg at its center. This is the time of year where we all celebrate new life. Spring is all around, and the appearance of leaf buds and flower blossoms are inspiring. Why not celebrate this newness with an Easter Tea Party? Consider serving folar, in honor of friendship. Char preferred the savory kind, but there are sweet versions as well. Sweets are a necessity! For fun, see if you can find chocolate fish, but if not, chocolate bunnies are just as fun! And don’t forget the decor. Be pretty in pastels, use tulips, daffodils or pansies for your centerpiece. If you want to go the extra mile, fold your linen napkins like bunnies! And of course, the tea. Kat and I have been indulging in Target’s Simply Balanced Organic Black Tea Earl Grey. Now, some Earl Grey teas can be a bit heavy handed with the bergamot, leaving one with a soapy sensation. This tea, however, has the perfect hint of bergamot – just enough of the citrus to give you the feeling of a sunny day! The black tea blend is hearty enough to work very well with milk and sugar (cubes, please! ), but smooth and balanced enough to be enjoyed plain. What Easter or Passover traditions would you incorporate into your tea party?